Arthritic pain can be very crippling. The foot is no exception. Look at the pictures below. It is easy to see the difference in a normal foot x-ray (right) versus an x-ray of rheumatoid arthritis (left). Historically joint pain relief has been achieved through anti-inflammatory medication (NSAID's). This class of medication can be very helpful but some people may pay a price for this type of pain relief. Over long term usage many people can experience stomach problems due to the irritation of the stomach lining from the medication. Less known side effects include kidney trouble and because many of these drugs retain sodium, they can elevate blood pressure in those with salt sensitivities,particularly the elderly. This includes the over-the-counter brands as well. Click here for a warning issued by the FDA concerning this class of medication (December 2006). Because of the potential problems with anti-inflammatory medication I tend to limit the duration that I allow my patients to take the medication. My opinion is that pain reduction through the use of this type of treatment is not a permanent solution and should be considered temporary at best. For this reason anti-inflammatory medication can be very helpful for acute arthritic flare-ups. In acute attacks, along with medication, physical therapy can be very useful. When necessary I will also give a cortisone injection. In the foot and ankle, strapping and padding the affected area may also bring relief, which eventually may lead to the use of an orthotic which works by stabilizing the foot so there is less stress on the joints of the foot. Less stress on joints=less pain. An orthotic will also cushion the foot which will also lead to a reduction in arthritic pain. Take a look at the KLM orthotics to the right; they are an amazing orthotic at a very affordable price. The problems with arthritis arise in the chronic form, or the progressive form where the problem just keeps getting worse. In these cases things like cortisone injections or physical therapy may reduce the discomfort but the pain will usually return at some point in time. WHAT IS OSTEOARTHRITIS AND WHAT ARE THE SYMPTOMS? 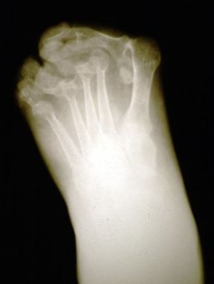 The type of arthritis most often seen in the feet is known as osteoarthritis, or the "wear and tear" type of arthritis. This condition is also known as degenerative joint disease. Basically, the joint just wears out over time. It is worth mentioning that the feet are not the only place where osteoarthritis occurs, if affects almost all joints in the body. Individuals with this type of arthritis will usually experience morning stiffness. You get out of bed and your joints seem stiff; they just do not move freely. However, as you move around, the joints loosen up and within a short period of time, you are moving freely. This is the early form of osteoarthritis. In the latter stages not only will you experience morning stiffness, but the affected joints will actually worsen the more you move around. This is a sign that your problem has worsened. This is also the symptom that brings most people to the doctor's office. 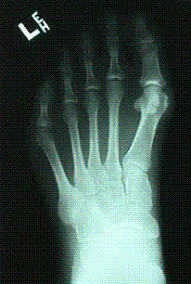 Typically, the very earliest signs of osteoarthritis is a narrowing of the joint space between the two bones that form a joint, as seen on x-ray. To the casual observer, this is easily missed. What this tells us is that the cartilage has eroded and so the two bones are closer together which limits motion and causes at the very least, morning stiffness. If you are just beginning to experience osteoarthritis or even if you have had if for a while but it is not too severe, there are things you might consider doing to slow down the process as it relates to pain in the foot or ankle. Lose weight-If you are overweight, look to lose that weight. Realize that the heavier you are, the more pressure you put on your feet and ankles and so the quicker the joints will wear out. If you are presently suffering now you can pretty much assume it will only get worse with time. Exercise-If you lead a sedentary life style consider exercise. The more you exercise the more you force the joints of the feet (and elsewhere) to move and so the less inclined they are to stiffen up. This may seem like a paradox because excessive movement of the joints is what initially caused the joints to wear out, but continued movement through exercise is what keeps them as limber as possible. When a joint is stiff and then is called upon to move, this limitation of motion is what causes pain. Drink lots of water-There is a debate out there today as to whether or not clean water in large daily doses is healthy or not. As it relates to arthritis, drinking large amounts of water daily keeps the cartilage (which is the end of the bone that meets the end of the other bone to form a joint) well hydrated and the better hydrated it is the more function you will get out of the joint. Avoid all types of carbonated soft drinks-The phosphoric acid in soda creates an acidic environment in the body and the way the body tries to neurtralize it is to pull calcium out of your bones aggravating osteoporosis. (it also pulls calcium out of your teeth). The same problem arises in people who eat too much red meat. Surgery?-In spite of all this there are individuals who suffer so much that eventually they must entertain surgical intervention. In an otherwise healthy individual I will recommend surgery if all conservative care has failed to bring adequate relief. It is all based on the quality of life a person wants to live. I have operated on people in their 80's because their foot pain was keeping them from doing the things they wanted to do. Of course in the elderly population the criteria for surgery is much more restricted and there is a limitation on the procedures that can be performed. In this day and age many people are looking for alternative forms of treatment to alleviate arthritis and musculo-skeletal pain. One popular alternative is the use of Glucosamine sulfate. This nutritional supplement has anti-inflammatory properties similar to the anti-inflammatory medication on the market with less likelihood of stomach upset. Most of the original studies with glucosamine were done in Europe and involved primarily knee pain. My experience has been that it can be effective in some individuals. For those who experience success with the supplement it is a wonderful alternative. However, like any other “pain reliever” it will only work on a certain percent of those who try it. I generally recommend one gram in the morning (two 500mg tablets) and 500mg at night. I suggest to my patients that they try it for at least three months and then decide if it is helping. I usually only recommend glucosamine sulfate and not glucsomine with chondroitin. Chondroitin is supposed to regenerate cartilage but I think the jury is still out on that. The only contraindication to glucosamine is for people who are allergic to shell fish since glucosamine is made from shell fish. So, is there a natural pain relief for arthritis? Below are some other little known remedies that you can try. They are safe and inexpensive. I would not recommend trying multiple combinations at the same time. DRINK TEA- research has shown that green tea is rich in polyphenols; a compound that suppresses a key gene involved in arthritis inflammation. Drink one or two cups of hot or cold tea each day. EVENING PRIMROSE- BLACK CURRANT AND BORAGE OILS-contain the essential fatty acid gamma linolenic acid (GLA), which reduces joint inflammation. Adding good oils like these to your body -- and eliminating your intake of bad ones such as saturated oils -- can help you feel better overall. Take up to 2.8 g of GLA daily. GINGER- is a popular choice for inflammation and pain relief. Pour boiling water over the grated root to make a tea, or add fresh ginger to your meals. If you want a stronger remedy, take 1 g to 2 g of the dried powder in capsule form two or three times daily, or use 1 ml to 2 ml of the tincture three times daily. MSM (Methylsulfonylmethane) - organic sulfur -- has natural anti-inflammatory benefits because sulfur is an integral component of cartilage. Take 2,000 mg to 8,000 mg daily. Reduce dosage if diarrhea occurs. It is also available in combination with Glucosamine. SAM-e (S-adenosylmethionine) - is an excellent supplement to reduce the symptoms of arthritis. A naturally occurring substance in the cells of the body that activates chemical reactions. In regard to the joints, SAM-e's methylation helps prevent the loss of water in cartilage, which keeps the joint more flexible. Take 600 mg to 1,200 mg daily for two months, followed by 400 mg to 800 mg daily as a maintenance dosage. BOOST YOUR INTAKE OF VITAMIN C AND D- vitamin C is believed to slow the loss of cartilage due to osteoarthritis, while a diet low in vitamin D has been shown to speed the progression of osteoarthritis. Daily recommendations for vitamin C is 500-1000mg. For vitamin D, take 400 IU’s daily. WILLOW BARK AND BOSWELLIA- willow bark is where aspirin comes from, while boswellia has been used for centuries to reduce inflammation and maintain healthy joints. Take 240mg of willow bark and 1000mg of boswellia per day. EAT GRAPES- grapes contain resveratrol, which is a natural compound known to act as a COX-2 inhibitor. Eat one cup of white or red grapes daily. Additionally, grape juice, unsweetened, and wine contain resveratrol as well. FISH OIL CAPSULES- fish oil among its many benefits will "lubricate" arthritic joints. Take them for a few months and you should start to experience less discomfort in your achy joints. In the United States vitamins and nutritional supplements are not under the jurisdiction of the the FDA. Because of this there are a lot of "snake oil salesman" out there. Particularly on the internet you will find outrageous claims made by people looking to make a quick buck. Secondly, if you buy low grade quality vitamins they either will be manufactured from very cheap sources or many times you will not get the actual dose listed on the bottle. Your 500mg. of vitamin C may actually only contain 400mg. (as an example). I am a big believer in the value of nutritional supplements but believe you also have to rely on natural food sources as well as vitamins to get a balanced mix for a healthy diet. Never use vitamins and supplements as a quick fix for poor eating habits. If you do take supplements you should be taking "pharmaceutical grade" vitamins. The company you buy from should adhere to the "Good Manufacturing Practices" protocol. Otherwise, you have no guarantee of getting the benefit you hope to derive from taking supplements. You are just wasting your time and money. For more information on this subject, check out the links below.